Excessive Sweating - How to Stop Sweating? 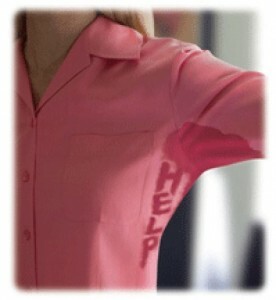 Do you suffer from excessive sweating, or hyperhidrosis? If you do, you know how embarrassing it can be. You can be in the middle of an important business presentation when you suddenly realize your hands or underarms are covered in sweat. Maybe you’re sitting down with your relatives at a holiday and your armpits become uncomfortably damp. Or maybe you always feel the slight tingle of sweat. No matter what triggers it, everyone who experiences this wants to know how to stop sweating. NB! Before you continue reading the article, I recommend you to take a look at the ebook called beat Your Sweating Demons which contains proven natural ways to stop excessive sweating forever. Hyperhidrosis, or excessive sweating, is actually more common than you’d think. What triggers it tends to vary from person to person. Some find themselves sweating during moments of stress, especially work related. Others find themselves suffering from excessive sweating at night. Sleeping with no blankets and with a fan blowing cool air at them doesn’t help—they still wake up covered in sweat. Others don’t sweat until they’re out in the heat. Many of these people are perfectly healthy otherwise, and they find themselves very stressed and annoyed that there is little they can do to stop excessive sweating. Axillary hyperhidrosis: sweating from the armpits. While it’s not life-threatening in any way, hyperhidrosis leads to embarrassment and difficulty with life. Many avoid social situations, won’t shake hands, have trouble forming romantic relationships, and may even have trouble writing or using anything that requires gripping items since the sweat makes it hard to hold items. A lot of people simply assume that they will have to live with this sweating. How to Stop Excessive Sweating. Antiperspirants. However, there are many different ways to control sweating, and some work better than others. The first way to stop excessive sweating is to purchase powerful antiperspirants. Those who suffer from excessive sweating will start fighting it by purchasing standard antiperspirants. However, these antiperspirants may not work, especially if your excessive sweating is truly excessive. There are, however, some more powerful antiperspirants out there. They’re designed to combat excessive sweating, and while they are more expensive, some say they really do work. These prescription strength products all include aluminum chloride hexahydrate, a powerful antiperspirant. However, for many people, these antiperspirants aren’t that useful. That’s because some people don’t have excessive sweating in their armpits. Instead, they may experience it in other places, including the hands, feet, and even their chest or back. For them, the answer to how to stop sweating doesn’t involve antiperspirants at all. Instead, they can take some oral medication that helps control sweating. Called anticholinergics, this medication may help those who experience excessive sweating on their hands. They include products like Robinul. However, they do have a lot of side effects like burred vision and dry mouth. Because of this, they are not often used to stop sweating. Botox Injections - Cure or Nightmare? Botox injections are another option, even though it is more often used in cosmetic surgery. Given under the arms, Botox can help close up the sweat pores. However, Botox injections aren’t exactly pleasant. Each armpit needs at least 20 different injections per treatment. Also, you have to have repeated treatments about every 4 months or so. Botox has been used for excessive sweating of the hands and feet, although it has not as effective. These injections are more painful-hand injections often require pain killers. Iontophoresis - Is it a Myth? One of the oldest methods used to control excessive sweating is called Iontophoresis. It’s been used for over 50 years, but few understand exactly why it works. Studies have concluded that it most likely stops up the sweat ducts in some way. Iontophoresis uses water to conduct a light electric current over the patient’s skin. It’s not painful, despite what it sounds. However, it doesn’t work long-term, sometimes it doesn't work at all. In fact, patients usually have to have two to three sessions a week, with each session lasting up to 20 minutes. After that, patients have to return for another session once every few weeks, depending on how well their body responds. Some may need treatments once a week, while others may need a repeat treatment once a month or so. For some, none of these methods work. They may have to resort to expensive surgery. This surgery, called Thoracis sympathectomy, actually involves interrupting the sympathetic nerves that cause sweating. The doctor will insert a small endoscopic instrument into the body just below the armpit. This device is then used to actually destroy a small part of the nerve that connects to the sweat glands. While it is very effective, it is also very risky. Part of this risk comes from the fact that the patient’s lung is actually momentarily deflated so that the surgeon can see the nerves better. Side effects can actually involve causing excessive sweating in other areas of the patient’s body, nerve damage, and breathing complications. These issues are often very serious and cannot be reversed. Because of this, sympathectomy is seen as a last resort for those with excessive sweating. There are many natural treatments for hyperhidrosis. One of these remedies was baking soda. I used this method myself and that is how it work. After thorough washing, I applied cornstarch and baking soda under my arms. I waited 25 minutes and then washed the mixture off with water. Baking soda has the ability to absorb excess moisture, so no arm pit circles can be found on your clothes. I also added essential oils into the mixture to act as a deodorizer. The method seemed affordable and super simple, but it still did not give me the needed cure. Do not forget to wash and shave your underarms before using this method else it will not help you. While all of these methods can help deal with excessive sweating, many of them are not permanent. While taking medication, using prescription antiperspirants, and having Botox injections can help stop sweating, you have to spend money on repeat treatments, you have to feel pain, you have to suffer from serious side effects which can seriously harm your health. However, if you really want to know how to stop excessive sweating permanently, there is one really effective natural way. It’s a little known scientific method that can actually help you stop your excessive sweating forever. Want to know about it? Visit the link below to find out how to stop excessive sweating and vanquish this embarrassing condition from your life.